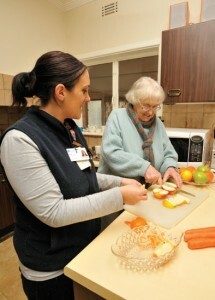 Our food services aim to help you stay healthy and living independently in your own home by providing a range of options to ensure you still get a nutritious meal when you are unable to cook or shop. This may include help with meal preparation within the home, Meals on Wheels or participation in social groups that centre around meals or cooking. Meals on Wheels provides nutritious and diet-specific meals delivered to the home by volunteers. We provide chilled meals prepared by the chefs at Bairnsdale Regional Health Service to people living in Bairnsdale, Lakes Entrance, Paynesville and Raymond Island. Volunteers deliver the meals from Monday to Friday. We do not deliver meals on weekends or public holidays to people living in Lakes Entrance, Paynesville and Raymond Island. High-risk people living in Bairnsdale may be eligible to receive a meal on weekends and public holidays. Conditions apply, please speak to our Meals on Wheels coordinator. Your meal includes soup; meat and two-thirds vegetables; dessert and orange juice. Please talk to our Meals on Wheels coordinator if you have special dietary requirements. Meals are delivered by our volunteers between 12.00 noon and 1.30pm, Monday to Friday. Please note that health regulations do not permit us to leave your meal at your home if you are not there. The Wheels to Meals program offers socially isolated people who may not be eating well the opportunity to get out of the house and enjoy a meal and great company. Participants will be picked up from home by our trained volunteers and taken to a local bistro, cafe or restaurant for a meal. People are able to make new friends and gain the confidence to get out and about. Our support workers can assist you with shopping and can work beside you to prepare your favourite meals. They can help you with basic food preparation such as peeling and chopping vegetables.